AFG 4.0AE Elliptical has a capacity of about 300 lbs and operates at 110 volt ac supply. It works in any of the many modes- Manual, Intervals, Weight Loss, Constant Watts, Incline 1&2, THR Zone, Custom. Its frame and brakes come with a lifetime warranty.The flywheel used is of 23 lbs and can be inclined upto 16 degree. 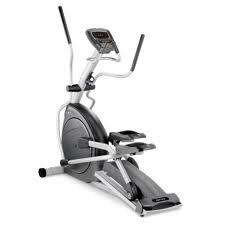 AFG 4.0AE Elliptical has a capacity of about 300 lbs and operates at 110 volt ac supply. It works in any of the many modes- Manual, Intervals, Weight Loss, Constant Watts, Incline 1&2, THR Zone, Custom. Its frame and brakes come with a lifetime warranty.The flywheel used is of 23 lbs and can be inclined upto 16 degree. Assembled Dimensions 68" x 27" x 69"
Shipping Dimensions 70" x 19" x 32"
Smoothest Starts And Stops- Together, the 23-lb flywheel and magnetic brake resistance create the smoothest, most consistent, most reliable drive system you'll find in an elliptical machine or cross trainer. Comfort And Confidence- The low, 14-inch step-on height makes entering and exiting the elliptical machine or cross trainer as easy as climbing a set of stairs, while the variable stride length and narrow, 1.2-inch pedal spacing help you find a natural and comfortable exercise position. More Fitness Choices- 16 degrees of motorized incline and 20 programmable resistance options allow you do everything from change the intensity level to shift the focus from one muscle group to another. TreadmillDoctor.com It is better than the 2.0 AE and 3.0 AE but doesn't stack up well against Sole or NordicTrack. The latest cost of AFG 4.0AE Elliptical will be updated soon. *Note: Most of the sites, stores or shopping portals listed above sell AFG 4.0AE Elliptical with discounts and other exciting offers. There is a possibility that the some of above websites are not selling AFG 4.0AE Elliptical now. Toughtrain.com is not liable for such cases or instances. Also we do not recommend any seller for AFG 4.0AE Elliptical and a buyer should buy from where he/she gets best deal with quality of products, service and on time delivery (shipment).